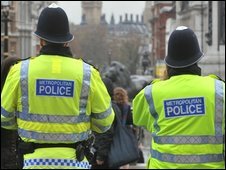 Six Metropolitan Police officers have been suspended or placed on restricted duties following allegations of ill-treatment after a police raid. The Independent Police Complaints Commission (IPCC) is investigating the Enfield-based officers' conduct, according to Scotland Yard. A man has claimed his head was put down a toilet which was then repeatedly flushed during a drugs raid last year. London Mayor Boris Johnson said the allegations were "extremely serious". The Met said the allegations raised "real concern". But they said they could not comment on the exact nature of the complaints. The raid on which the allegations are centred took place in November last year, during which five people were arrested. BBC crime correspondent Ben Ando said the allegations did not concern "waterboarding" techniques - previously used by the CIA to interrogate terrorism suspects - as some newspapers had earlier claimed. Water-boarding is aimed at simulating the sensation of drowning. It involves detainees being stretched on their backs or hung upside down, with a cloth pushed in their mouth or plastic film placed over their face before water is poured onto the face. A Scotland Yard spokesman said a police employee had raised concerns about the conduct of a number of officers, during an internal investigation into allegations of mishandling of property. "The Met's Directorate of Professional Standards (DPS) received information from a Metropolitan Police Service employee which raised concerns about the conduct of a small number of officers in Enfield borough," he said. "The Met's DPS then initiated a thorough investigation and as part of this made a referral to the IPCC in April 2009. "The IPCC is independently investigating the actions of six officers during the arrests of five people in November 2008." The spokesman added that it was "not appropriate to make assumptions" while the investigation was ongoing. "That said, these are serious allegations that do raise real concern," he added. "The Met does not tolerate conduct which falls below the standards that the public and the many outstanding Met officers and staff expect. "Any allegations of such behaviour are treated very seriously, as this case illustrates, and if found true the strongest possible action will be taken." The IPCC said the case was being handled by a team of investigators. The Metropolitan Police Authority said it would not "tolerate behaviour by Met officers that impacts negatively on community confidence and trust in their police service, and falls below the standards required from serving officers and those rightly expected by the public". London Mayor Boris Johnson said: "Clearly these allegations are extremely serious and need to be thoroughly investigated. "It is reassuring that these matters came to light as part of an internal Met Police investigation," he added. Scotland Yard has said the borough commander in Enfield is moving to a new job, where he will be working to the Deputy Commissioner on strategy and policy. Asked whether the move resulted from Scotland Yard's internal investigation, it said it would be inappropriate to pre-empt the ongoing inquiries.